Kathryn Morgan is such an inspiration! What a lovely article about her. In 2009, Kathryn Morgan, a young ballerina from Mobile, Alabama, was promoted to soloist within the New York City Ballet, which she had joined as an apprentice in 2006. She was hardly in the role for more than a seven months when she was diagnosed with an under-functioning thyroid, and found herself back in Alabama in 2012. However, she didn’t let her diagnosis get the best of her, continuing to dance with the company she grew up watching. Along with maintaining an active social media presence, Kathryn is currently preparing to make her debut with Ballet in the City, which will include the world premiere of her exclusive Red Shoes variation. I had the opportunity to sit down with Kathryn via phone last month and talk to her about her career, her illness, and what’s next for the ballerina. I’m still here and kicking it…er…frappe-ing it…so to speak. Lots of new things to talk…. er…to develope about! Awww…the Ballet buns puns never end. Who knew ballet was more than just movement? OK, so have you seen Taylor Swift’s newest video, “Shake it Off”? So, I think this is something that has a great message for those of us in the “adult beginner/back to ballet” category. I know most of us worry about being the worst one or looking a fool. Who care’s what anyone else can do, just shake it. Go shake it, adult beginners, and shake it big but remember to point your toes. This was too funny not to share….and now I have another picture to add to my Four Little Swans collection! Well…off to a sushi birthday lunch and then to ballet class tonight!!! I seriously thought she was kidding at first and I think my two fellow classmates did too…but she was serious. SERIOUS I tell ya! She even added we could do them corner to corner. I decided to keep them straight on and focus on my technique and pray I make it half way. 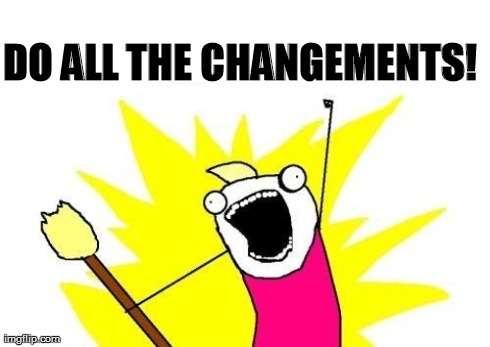 Guess who did 32 changements like a boss? Ballet is timeless, wouldn’t you say? It stays the same yet evolves. 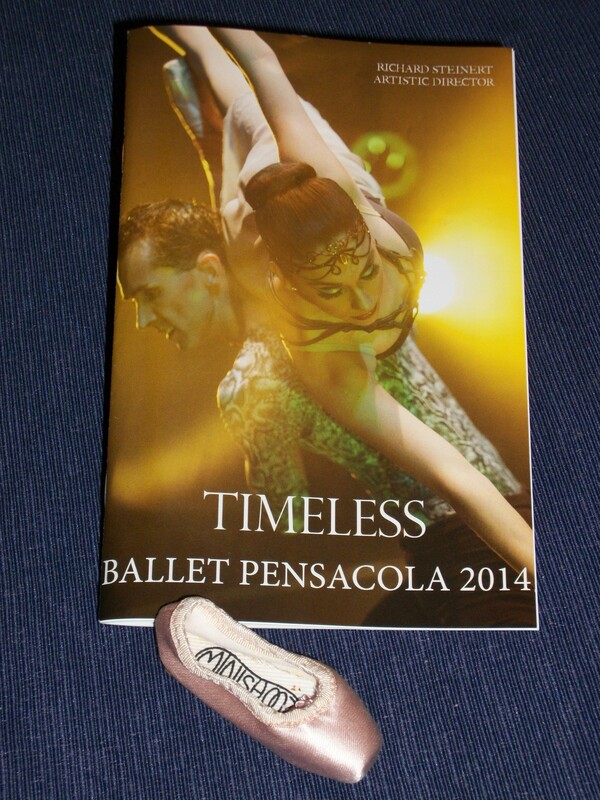 In March, my son and I attended the local professional ballet company, Ballet Pensacola, mixed repertoire production called “Timeless”. It was truly wonderful and I was so impressed with the dancers and the company. I had just started back into ballet classes so I was really excited to go and see this. My only hitch was ticket cost, since I just started back into classes, I was pinching pennies. I was not sure I really could afford to go. I got lucky, and for once my lazy perusal of facebook paid off, as they advertised on there a buy-one-get-one-free ticket flash sale. Ballet boo-yah! I can afford it now! So, I get down to the box office theater and they ask for a passcode. I was like whuuut? There was nothing about needing a code to purchase the tickets on their facebook page (I know because after I got home, I checked). So the girl gave me a hint and being a bunhead, I guessed it. I can’t remember the question but the answer was Swan Lake. I was so happy I got the tickets since it was the only way I could afford it. 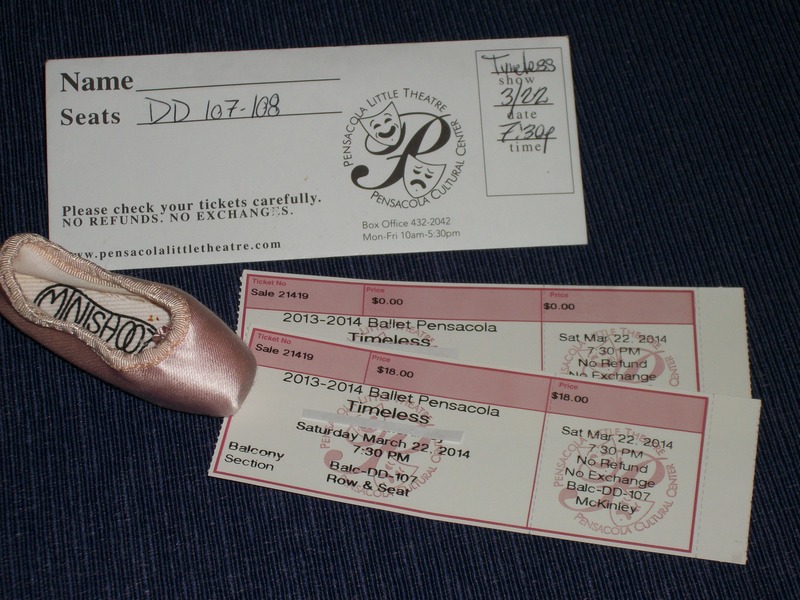 My tickies for the performance and I threw in my mini-pointe shoe to make the picture “extra ballet-y” Notice one of the tickets is priced “$0” since it was bogo- ballet boo-yah! Since my husband had to work, I took my seven year old son with me. He and I have “dates” where we dress nice and go out to lunch or dinner together and have special Mommy-son time. We’ve been doing this since he was about two years old and it’s one of our favorite things we do together. I thought this would make for a great “date” for us. He was excited to go and be in a “real” theater. I learned he was a little nervous there were going to be too many girls and not many boys though. He is at that age where it’s important for the boys to equal or out number the girls. LOL I wanted him to experience something more cultural and what a live performance is like. TV and YouTube can only go so far. Who knows, he may want to try ballet after seeing it? Yeah, nooo…. So, for our date, we dressed really nice for the ballet. He wore a tie and I had my hair curled and wore my purple sparkly top. We looked so fancy! He wanted to go to his favorite restaurant, Red Lobster, and use his gift card from Santa Claus. Since I saved on the tickets to the performance, I was able to grant his request. He ate crab legs and I had the shrimp scampi. We laughed and talked and had a great time. Now that we have full bellies it’s time to get to the theater for the show…so excited! Did I mention this was the first live ballet performance I had seen since I had been in one, like forever ago? I was ready to come out of my skin I was so excited. I knew they are a mostly contemporary company but was not sure what to expect when it came to what they were going to perform but I didn’t care…I was just happy to be there. We get to our seats and we are in the balcony. Did I also mention my son is not a fan of heights? He did NOT like the sloping down stairs of the balcony to our seats. For a few moments I was worried this was not going to happen. I eased him to our seats and once he realized we were a few rows back from the edge he was OK and started to dig being up high. I felt the balcony was really high up and close to the stage. Like weirdly close. I was thankful I had gotten the BOGO tickets and made a note to myself to get floor tickets to any future performance at this theater. We also had the requisite 7 feet tall gentlemen that seem to follow me to any event I go to and are seated directly in front of me. The seats were also minuscule. Airlines make bigger seats. LOL Regardless, it was fun watching the people file into their seats dressed up for the ballet. It was closing night and you could just feel an excited air about the theater. Half of it was probably radiating off of me. We look through the program to see what they were going to perform and I saw it was a mixed repertoire of two classic pas de deux’s and the rest was contemporary. The first up was the Black Swan Pas de Deux! I was stoked. That is one of my all time favorite pdd’s! There was also the Peasant pdd from Giselle. I had been hoping for more classics but interested to see what the contemporary would be. I have not ever been to a contemporary ballet performance. I also love to peruse the dancer bio’s in the programs too. Like where they trained, are they a soloist, principal, apprentice…I just love that stuff. So, have you seen the ad from Free People clothing? Honestly, I’m divided. I could connect to the dialogue, whether real or fictional. The dancing I thought, well she’s just going with it and being free, maybe she had limited instruction and doing the best she could and just moving from the heart, which I think is beautiful. I mean not everyone who is dancing from the age of 3 is of the level of Osipova, Makarova, or Baryshnikov. Maybe she takes only a class a week? Then she went en pointe and I thought an ankle was going to be broken or a knee twisted. I don’t really know who the model/dancer is and if her “story” is real or just a story. 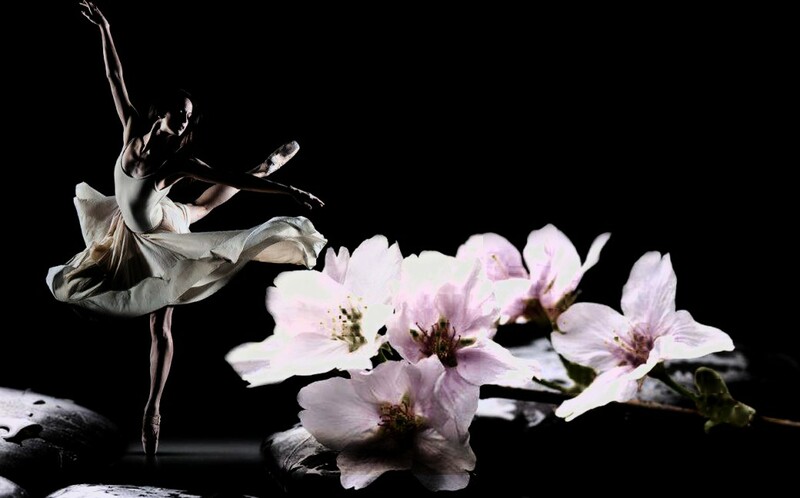 As an adult returning to ballet, I want to be supportive and do not want to tear her down. She did her best in the ad. She is a beautiful young lady who obviously takes care of her body and looks fit. I saw some really nasty comments on YouTube and other places on the web where this ad kept creeping up. You can be critical without being an “arse”. My issue is more about the company than the dancer. Who knows what this company was wanting to convey with her story. Maybe they didn’t want “perfect” maybe they wanted someone with imperfections, which is all of us, to make us more relate-able to the products? I do find the pointe technique concerning and not responsible of the company or the dancer’s instructors, but who knows the full story, it’s just an ad. If you go on their website, they do have a selection of ballet clothes, which are really pretty. They aren’t like “traditional” ballet clothes but barre wear, like for a barre exercise class maybe? Some not are my style for ballet class but look really comfy. They look nicely made as well. I liked their website but I doubt their price points will work with many dancers. Some of the product pictures have 15 second videos of her dancing. You can tell on her face she is enjoying herself. Dance isn’t always about perfect technique but the joy and beauty from the heart, and she does convey that to me. From a consumer/marketing perspective, while the pictures of the dancer/model are really pretty some I find take away from the clothes because of the technique. If this is their idea of ballet then…perhaps a bit more research on ballet when they want to sell something to the ballet world? It seems many in the ballet world are offended by the ad, and I can understand it. So, would you want to buy something from a company who represents ballet like this? I think of Cloud and Victory and Discount Dance Supply, among many others, who utilize dancers for their advertising campaigns, which in my opinion, lends credibility to the products they are selling. I am adult ballet beginner returning to the world of ballet after many years. This is the story of my return to the ballet dance studio as an adult.